There is a news around the world of people in pakistan burning effigies (representation of a person, especially in the form of sculpture or poster) of Pakistani players who failed to bring the cup home with the defeat to India. Though this has been denied by Pakistani media and pour correspondence from Pakistan. “Though you can feel a general atmosphere of sadness in Pakistan over defeat but people are still quite appreciative of the fact that their team played well in the tournament and performed well beyond any ones expectations to be in the finals in the first place,” said Hussein, a Pakistani man. People broke their TV sets, a student has reportedly taken poison (says DNA) and infact Lahore high court was approached with a complaint that the government had “gifted” the World Cup semifinal to India in a bid to improve bilateral ties, as premiers of both the countries had informal talks in the stadium. It is believed that former Pakistan Cricket team coach, Bob Woolmer was murdered in Jamaica after the team was shown early exit in last world cup in 2007 by the new team Ireland. Cricket is something which is taken as religion in South Asia. Fans arrive in the stadium or in front of their TV set to cheer for their country. Sports is always an entertainment and glamour these days, but no, this is not true in the case of India and Pakistan cricket match. Due to the decade long rivalry and a sense of superiority in one over the other makes this match a very different than others. Tensed fans and pressurized players, it is very common in India Pakistan match. People pray more than actually enjoying the match care free. Someone said it right, India-Pakistan match is not between two teams but it is between the whole two countries who haven’t forget any incidences of past conflicts. This would be wrong if we say cricket has created more tensions among the people of India and Pakistan against each other. Cricket has helped improvement in relationships time to time. Some people says that it is always good to meet people from other side of the border during cricket as there is hardly any difference between them. And some says that a cricket game satisfy them so much that there is no need of a war. The above statement sounds little awkward, but if a charming, glamorous, energetic, and harmless game can prevent war, then what can be better than that? Few Quotations and Reactions by the key people after the match was over. “Best thing about our team is our unity. We are not criticizing each other, everybody is helping each other. It is a team sport,” said M.S Dhoni, Captain of India. “Tried my best. I apologize to my nation,” said Shahid Afridi, Captain of Pakistan. 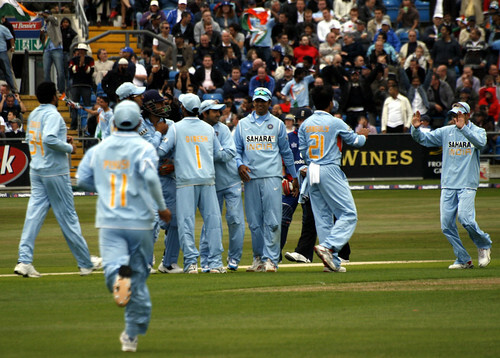 Ricky Ponting also commented about the extra ordinary performance of Yuvraj Singh. Though Yuvraj Sing was gone for duck in the match against Pakistan, he managed to get two Pakistani batsman out.